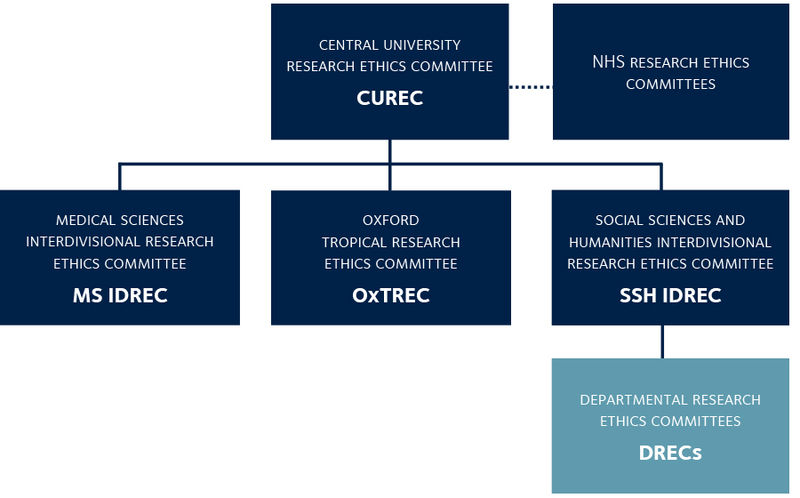 Departmental research ethics committees (DRECs) have delegated authority from the Social Sciences and Humanities (SSH) IDREC to approve research with 'straightforward' ethical issues (ie CUREC 1A applications). DRECs report to the SSH IDREC on a termly basis. Less straightforward cases where full CUREC 2 applications are required must be submitted to the DREC in the first instance for initial review, and processed by the DREC within three weeks of receipt. Once the DREC is satisfied, the CUREC 2 application will then be sent to the SSH IDREC for final review and approval. Where researchers apply for ethical review after the commencement of their research, they may only apply to the SSH IDREC, not their DREC. Please see the SSH IDREC and DREC application process page for further information. The following departments have DRECs. Please apply to the DREC following the same principles as for applications to the SSH IDREC. All DREC administrators and chairs have access to the DREC Network SharePoint site. The DREC Network meets termly. The SSH IDREC Secretary updates all DRECs on latest changes to CUREC forms, best practice guidance, approved procedures, and invites guest speakers on ethics-related topics, such as information security and research data management. The SSH IDREC encourages departments and faculties to consider setting up their own DREC. Please see the DREC template constitution, which all DRECs need to adapt for their own departments. For further advice on how to do this, and how DRECs report to the SSH IDREC, please contact the SSH IDREC Secretary at ethics@socsci.ox.ac.uk.